I hate to cook food when I have only 2 or 3 veggies in bulk and have to use them. If I am happy and in a mood I go crazy with that stuff else it would be the same old story...Now this mood to cook something new comes to me very rarely and when it comes I am totally into it..What about you guys? Here is a recipe that came that way...Wanted something that was not oily...That would burst with flavors and not much work(first priority)...:)..Just wanted to say one more thing...I don't cook my regular and crazy meals using tsps and tbsp...so the measurements are approximate..
1. Cut the cauliflower to florets and wash them in warm water.Drain and set aside. 2. In a bowl mix all other ingredients to a smooth paste. Add the cauliflower into it and mix well till all the paste mixes with the cauliflower.Set aside for 30 mins. 3. Heat a oven at 350F. Line a baking tray with foil and spray non stick oil. Drop the cauliflower into it and bake for 1 hour approx. Do take the pan and give it a stir after 30 mins.Bake it till its soft and lightly browned. Labels: Baking, Dry, pizza, sidedish, Starter. Delicious and flavorful.. Absolutely love it.. Beautiful clicks.. Very inviting and tempting cauliflower. Love to try it. 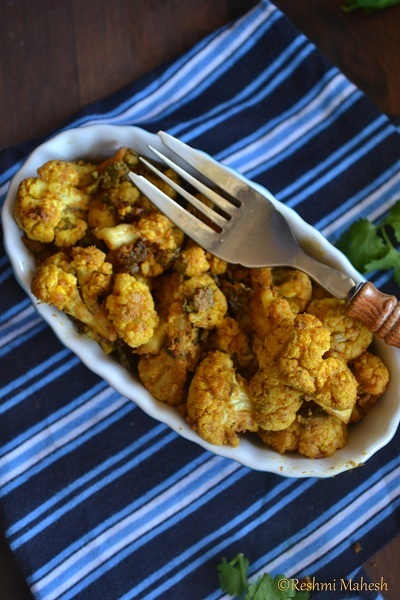 Baked cauliflower looks perfect dish when we are in a hurry. that is so healthy and yummy!! 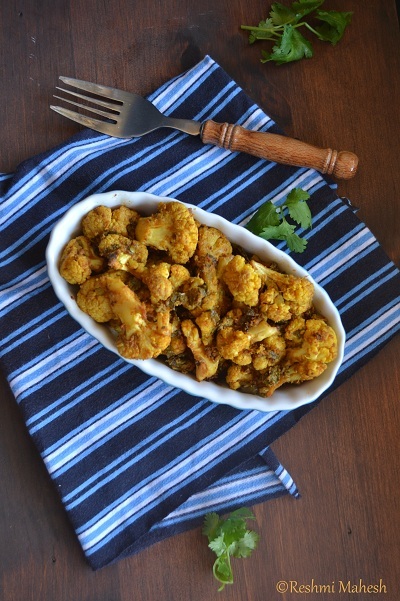 These baked cauliflower looks yummoo.. perfectly captured dear. u have improved a lot in ur photography. i am just stepping into this new field. actually do not have much time to look into photography after the office and cooking. loved ur recipe ..will surely try..thanks dear. love the way you have presented the recipe with the picture of cauliflower in the last image. very nice. Baked cauliflowers look so good, and I was wondering it takes approximately 1 hour to bake? 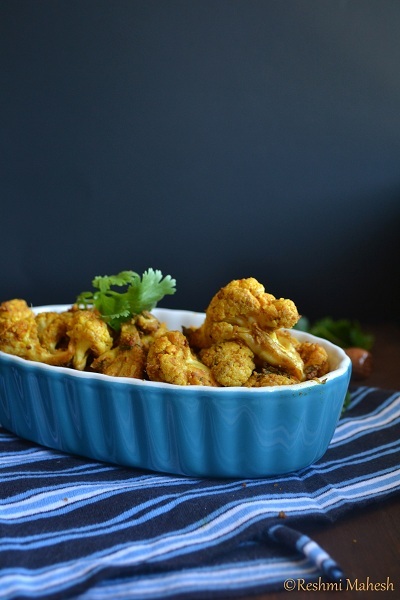 liked last click.. i love blue :) baked cauliflower must be very delicious..
Love these healthy baked cauliflower anytime...looks crisp n tempting !! 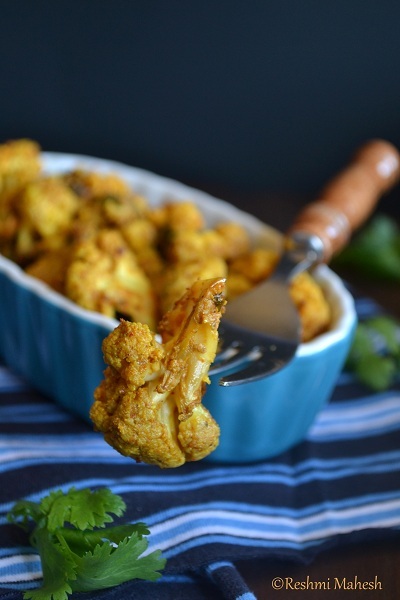 Nice and yummy flavorful recipe to bake cauliflower..
yummy...i love cauliflower in every form :) love the blue dish!! Quick and delicious recipe...Healthy too.. Irresistible gobi, seriously inviting me. I love anything healthy. My son eats it like pop corn. Your version looks so good too. What a great recipe! 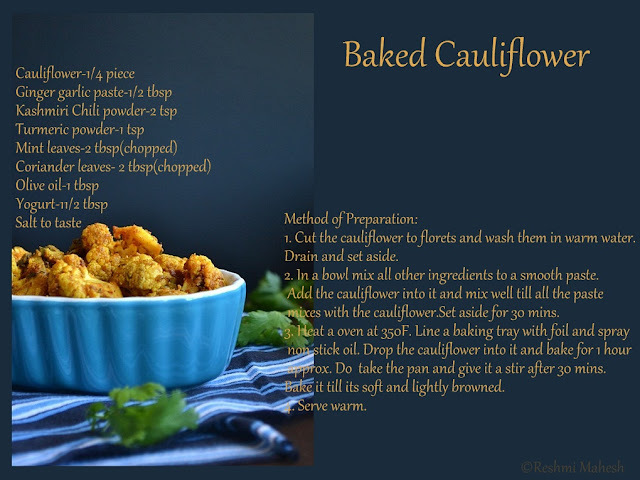 My husband loves cauliflower so I'm always happy to find new recipes for it. Thanks for sharing, looks delish! 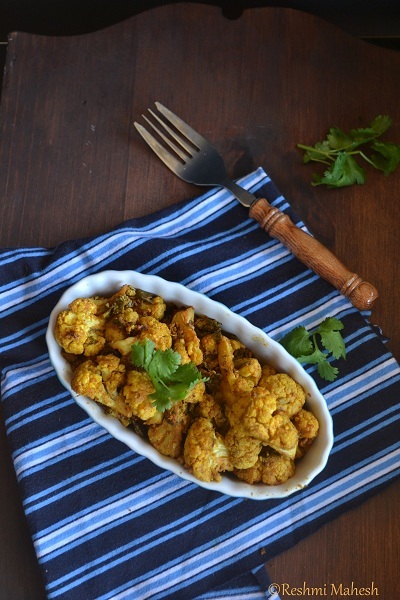 Very healthy and nice version of cauliflower. never tried baking. The cauliflower looks delicious and inviting..would love to try this one. 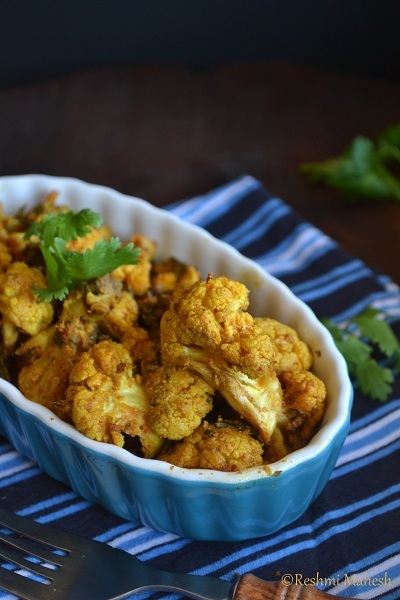 Love this flavor packed baked Cauli.